This stylish drum lamp shade comes in an almond linen blend fabric with a matching "flower". 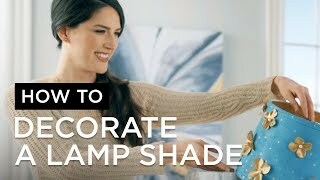 Brighten a lamp with the chic elegance of this lamp shade design. It features almond linen blend fabric with a matching fabric "flower" for a stylish look. Almond linen blend fabric drum shade. Beige liner helps soften and diffuse the light throw. 11" across the top x 12" across the bottom x 11" high. Almond linen blend fabric drum shade with fabric flower. From the Springcrest Collection™ brand of lamp shades. Beige liner, polished brass finish spider fitter. the shape is small for the space I have and the fabric looks nice. Simple but the flower adds something. To match another lamp I already have. BEST ANSWER: Hi, Patricia. My harp is 7 1/2" also. My shade is perfect . It is 11" tall and 12" wide an the center .....and the top and bottom is 14". It is a very pretty shade...although I thought it was pink. ...and it is definately beige. But I still love it. Mine is on a floor lamp. I used to decorate and stage for a living. It is perfect. Hope this helps you. Kristin. I love this lamp shade. I would love to see more cutsey shades like this in different sizes, colors, and shapes. Thanks to the designer!! The flower softens this tailored lampshade and adds so much charm. It also can echo other floral motifs in a room without adding more busyness. I love the neutral color--works well with white and green in my room. This exceeded my expectations, superb quality! 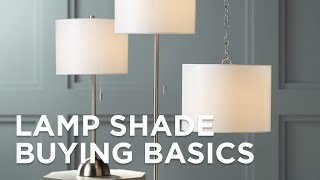 Would recommend to anyone wanted to update a lamp. I loved this lampshade and it's design. However, it turned out to be a little too small for the floor lamp I wanted it for. Otherwise, it was just beautiful. I replaced an old shade with this one and it gives a nice modern look in my bedroom. Very pretty. Strongly recommend it! my sister is happy with this shade . Just what was needed for the inherited lamp. People love it. I only bought these to match something I already had. I purchased the lamp and the shade for $30 at [...]. I wish I had bought more than one lamp. Now I have to pay a lot of money for something I know is not worth the price. Quatrefoil trim lines the bottom edge of this lovely bell lamp shade for the elegant home.